Presidential Spokesman Salvador Panelo insisted on Tuesday, November 6, that President Rodrigo Duterte did not ask Filipinos to vote for musician Freddie Aguilar, even if official transcripts and videos of the Chief Executive's apparent endorsement prove he did. "Hindi naman eh (Not really). He (Duterte) was just expressing his opinion on the qualification of the person. Hindi naman niya sinabi, 'Iboto 'nyo ito' eh (He didn't say, 'Vote for him')," Panelo said in a Malacañang news briefing. 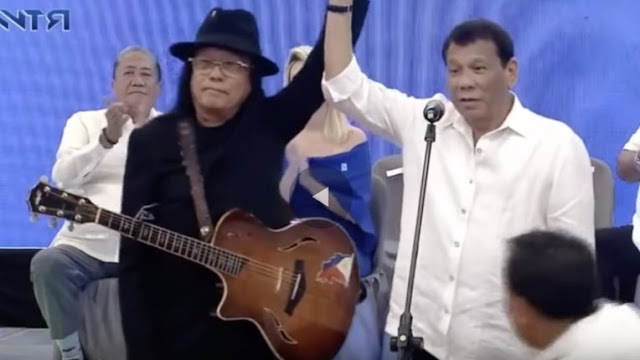 Yet Duterte had raised Aguilar's hand on stage during the Parañaque Integrated Terminal Exchange inauguration and declared, "Vote for Freddie Aguilar!"